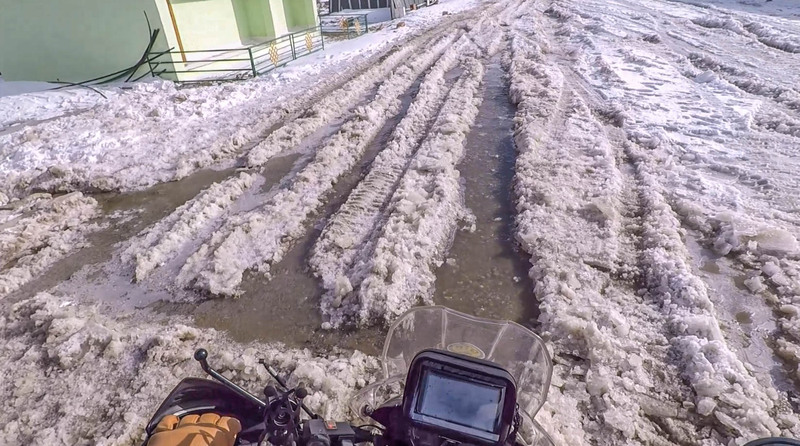 When riding up to the Gurudongmar and Tso Lhamo lakes in North Sikkim, Denzil Nunes and I used the tyre tracks made by the Army trucks and jeeps. I thought the return journey would be a little easier because the snow would have melted during the day and the underlying dirt of the track would be exposed. That was true for the lower portions of the track towards Lachen. But at the higher portions, the snow was just too much to completely melt away. To make it worse the Army vehicles had completely wrecked the track in some places. So what we ended up with was an unholy mixture of snow, ice, water and dirt. It’s a miracle that we didn’t lay our motorcycles sideways that day. We did have a few close calls where the front slipped dangerously out of control. But thanks to the light and manageable weight of the Hero Impulses, we were able to straighten ourselves before things went south. Dropping a motorcycle isn’t really a big issue. We do that all the time when riding trails in and around Goa. But falling down at 17,000 feet quite literally knocks the wind out of you. Falling into an icy puddle of water will only add to your misery. And then you need to pick up the motorcycle and continue riding till you drop it again. I’m really glad I picked my Hero Impulse for this ride instead of my Triumph Tiger. There is no way I would have been able to manage the Tiger on this slippery track at this altitude. Many people have asked me why I bought the Impulse when I already had the Tiger. This is why. The kind of stuff I have started doing on motorcycle off the tarmac is a little extreme and I really need to use the right tool for the job if I’m going to enjoy the experience. Which is the whole point of all this madness. To enjoy it. I see no point doing something challenging and then feeling miserable about it.